The Genomics/Transcriptomics Core (GTC) provides scientists of the IMS access to the modern genomics instruments, as well as experimental and bioinformatics services for state-of-the-art genomics and transcriptomics studies. 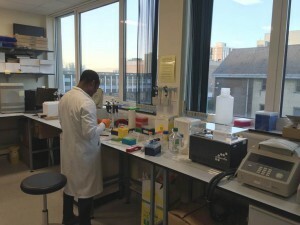 Located at the IMS-Annexe on Level 4 Laboratory Block, the GTC currently houses equipment for traditional Sanger sequencing, real-time quantitative PCR, Affymetrix microarrays, as well as automated liquid handling. In 2014, we formed a collaborative partnership with the Genomics Core, CRUK Cambridge Institute and we provide low-cost next-generation sequencing (NGS) facilities for the MRL as well as other MRC-affiliated units. All new users have to register with either David Withers or Marcella Ma, who will then provide appropriate training and registration onto our online booking system. For any enquires, please contact us via email gtc@medschl.cam.ac.uk.